September 2018 is a monthlong celebration of the 40th anniversary of the ‘Bloodbrothers’ tour. 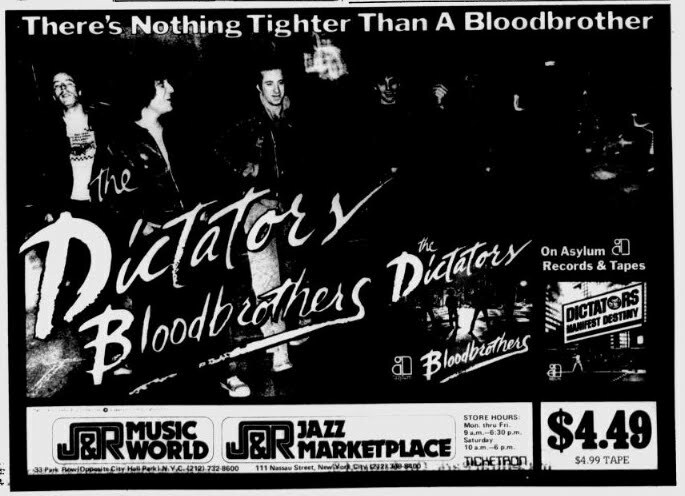 After the huge misstep that was ‘Manifest Destiny,’ aka ‘The Dictators Get Housebroken,’ ‘Bloodbrothers’ was seen as a fresh and enthusiastic, stripped-down display of both the band and their sound. It took three tries, but it finally looked like it was best foot forward with this chance at grabbing the brass ring. It seems inconceivable that “Stay with Me,” the most enduring track of the album, and indeed one of the highest profile songs the band ever had, was almost completely ignored at the time of the LP’s release. With hindsight being 20/20, it seems a shame that the album was recorded so quickly in April that there wasn’t time to include “New York, New York,” which was already in the live set by early June. Imagine how much stronger the album would have been with NYNY replacing one of the weaker tracks from Side 2. You pick which one. The reception on the road for the stripped-down band was as indifferent as it had been for the MD lineup. Sometimes they headlined to enthusiastic crowds (SF, Boulder, Boston), sometimes the crowd was openly hostile (Portland, Chicago). There was a week spent enduring a mismatched split bill with Canadian prog-rockers Max Webster. Mostly, they were yet again stuck on the same treadmill of being the dreaded and unwanted opening band. Coupled with waning enthusiasm from Asylum, it took less than two months on the road for the writing on the wall to get large enough to be seen from the Space Shuttle, and for things to grind to a halt. Really, who could blame them for throwing in the towel? You can only get kicked in the heart so many times. 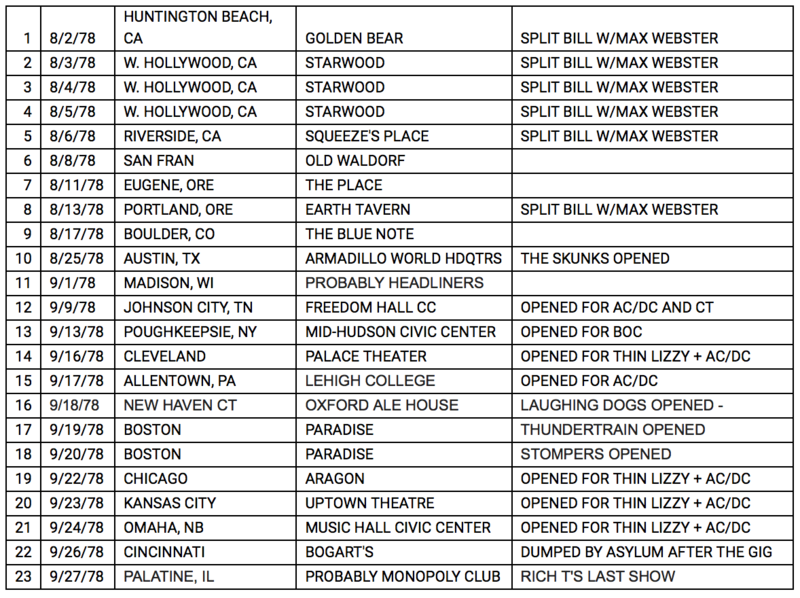 How much garbage and beer needs to cleaned off the amps (thank you, Chicago!) before you say, “no mas”? Asylum dumped the band on September 26, and Rich Teeter turned in his notice the next day. There were still farewell shows to be played, so the band grabbed rehearsal drummer Mel Anderson and limped along into December. Another “what could have been” ended with a long and slow fade-out. So you saw the Dictators 9/20, and I saw them on 9/22, getting absolutely pummelled by the notorious Aragon crowd. Yet we didn’t know each other until a few years later. Small world, but I wouldn’t want to paint it. I have no recollection of The Monopoly Club in Palatine, Il. Had I known about the gig, I’d have been there. Curse you internet, why weren’t you around back when I actually wanted to leave the house? The only rock club I knew of in Palatine was Durty Nellie’s, which is still around, now in it’s second location.